"It is not enough simply to bring more light into the cell," says Becker. Such surface structures can even ultimately reduce the efficiency by impairing the electronic properties of the material. The idea that David Eisenhauer worked out as part of his doctorate in Becker's team sounds quite simple, but it requires a completely new approach: to produce a structure that behaves "optically rough" and scatters the light, but at the same time provides a "smooth" surface on which the silicon layer (the most important layer of the solar cell) can grow with virtually no defects. The procedure consists of several steps: first, the researchers imprint an optimised nanostructure onto a still liquid silicon oxide precursor layer that is then cured with UV light and heat. This creates tiny, regularly arranged cylindrical elevations that are ideal for capturing light. However, the absorbing layer of crystalline silicon cannot grow flawlessly on this rough surface, so these structures have an unfavorable effect on the quality of the solar cell. 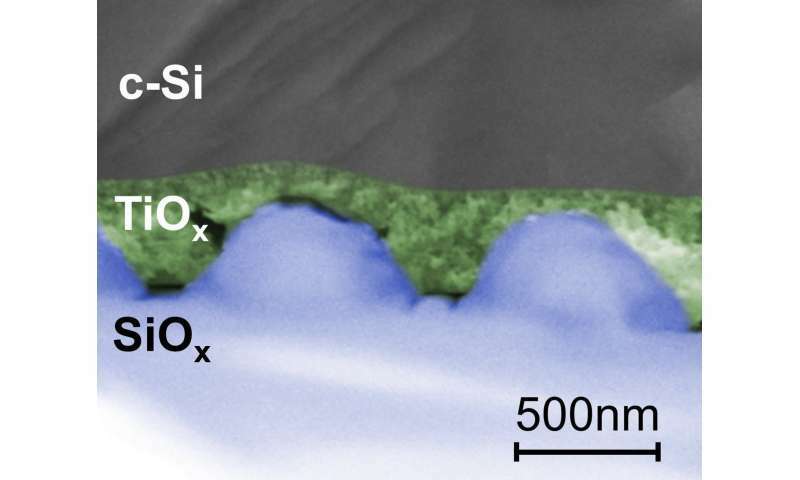 In order to resolve this conflict, a very thin layer of titanium oxide is spin coated on top of the nanostructure in order to produce a relatively smooth surface on which the actual absorber material can be deposited and crystallized. The coating has the descriptive name "SMART" for smooth anti-reflective three-dimensional texture. It reduces reflections and brings more light into the absorbing layer without impairing its electronic properties. The procedure is now patented. Christiane Becker heads a Young Investigator Group at the HZB funded by the BMBF under the NanoMatFutur programme. As part of the BerOSE Joint Lab, she works closely with the Zuse Institute to use computer simulations for understanding the effects of nanostructuring on material properties.